The existing Town of Beaver Dam Town Hall, at just 1000 square feet, proved too small to accommodate the needs of the growing township. The space, used primarily for Town meetings, voting and related work, lacked the capacity to best serve the constituency and doubled as the township’s business offices. Additionally, the Police Department’s space needs were being entirely underserved in an adjacent 100-square-foot office. 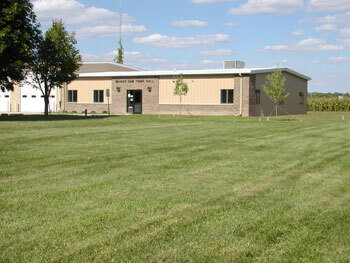 After performing a needs assessment, the Town of Beaver Dam retained Kunkel Engineering to design a 2000-square-foot addition to the building. Specific requirements of the plan included designated space for the business offices and the police department, a meeting room with capacity for at least 100 people, a conference room, record storage and ADA-compliant restrooms. One additional feature designed specifically to meet constituent needs was an exterior-access drop box for after-hours use. Construction began in October 2001 and was completed by May of the following year.